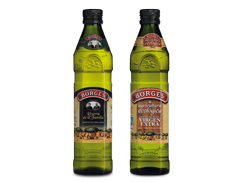 OLIVE JUICE, PURE OLIVE JUICE ENTIRELY OBTAINED THROUGH MECHANICAL PROCESSES. IT IS IDEAL TO CONSUME COLD OVER ANY DISH. “FAMILY RESERVE” EXTRA VIRGIN OLIVE OIL AND ORGANIC EXTRA VIRGIN OLIVE OIL. 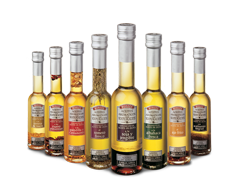 VERY SPECIAL PRODUCTS FOR THE MOST DEMANDING PALATES. 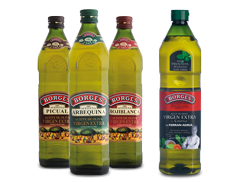 THIS RANGE OF NATURAL AND ORIGINAL AROMATIC EXTRA VIRGIN OLIVE OILS HAS BEEN MADE IN COLLABORATION WITH FERRAN ADRIÀ. 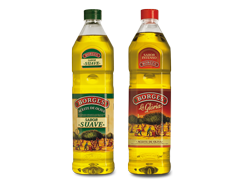 THESE OILS HAVE BEEN DESIGNED TO ADD FLAVOUR TO ALL TYPES OF DISHES. 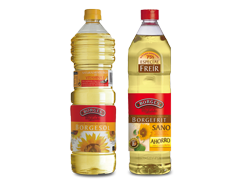 IT IS OBTAINED FROM THE BLENDING OF EXTRA VIRGIN AND REFINED OLIVE OIL AND SUITABLE FOR PREPARING DISHES WHICH DO NOT NEED AN ENHANCEMENT OF FLAVOUR. IT IS OBTAINED BY CRUSHING SUNFLOWER SEEDS. IT HAS IMPORTANT NUTRITIONAL PROPERTIES AND SUITS ANY BUDGET.